Did you win the mega-millions lottery a few weeks back? No? Me either. I tried twice, but each time, nada. Not even a single freaking number. Odds are 1 in like, 350 million, so I guess I shouldn’t take it personally. The good news is, someone did win and I bet they’re going to rock the you-know-what out of those winnings. Wouldn’t it be fun if your guests could play the lottery at your wedding and… won? Or YOU won and your honeymoon + cake + gown + dozens of wedding costs were immediately paid for? Sounds pretty amazing! 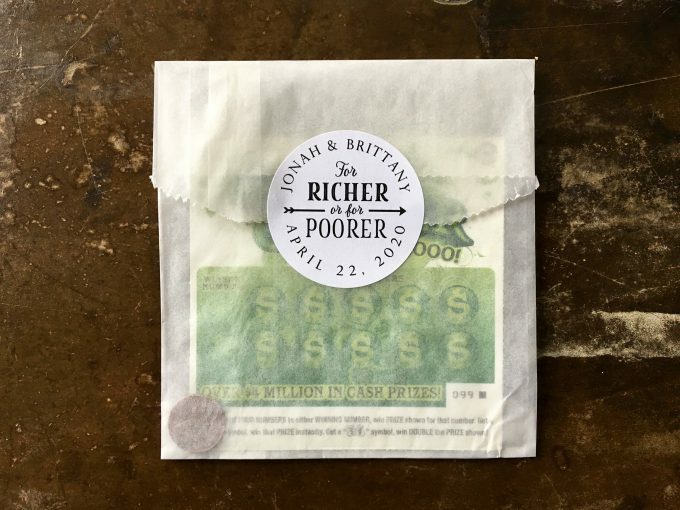 That’s what we were thinking when we spotted these lottery ticket favors at Clementine Weddings. That would be so fun. Even a couple lucky $10 or $5 winners on scratch-offs would be fun to see. We’ve shown you another “For Richer or Poorer” favor idea here using chocolate coins, which is brilliant; this favor idea really takes the richer part seriously and gives guests a chance to hit it big. Or not. But it’s fun to play, isn’t it? While these lottery ticket favor holders don’t include lottery tickets themselves — you have to cover those yourself, and be 18+ obvs — they do include everything else you need to turn ordinary lotto tickets into stellar take home favors your guests will be chatting about during dinner. P.S. 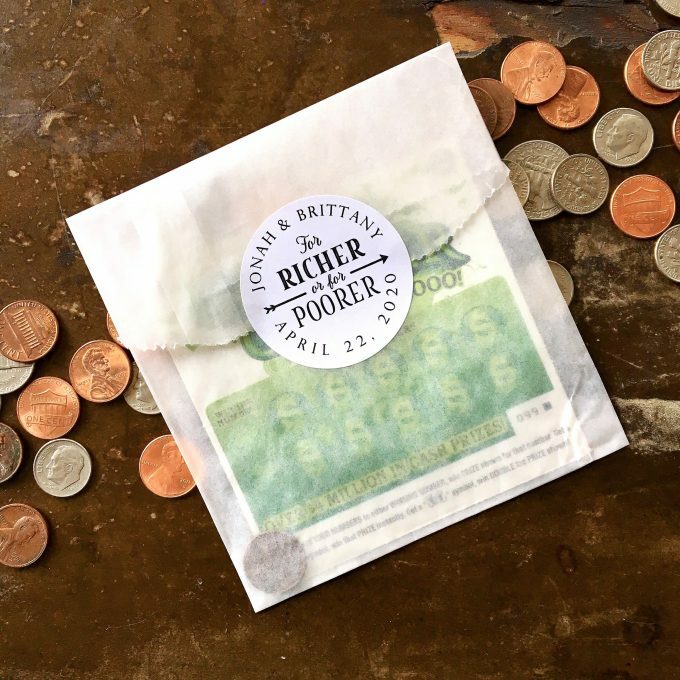 Don’t forget a shiny lucky penny inside each bag for scratching off the tickets! And the richer or poorer part: an absolutely genius way to tie it all together. What a fun idea! Buy your lottery ticket favor holders here! P.S. Please gamble / play lottery responsibly! That is obvious but felt necessary to state. You won’t win, no one really ever does, and it’s really just fun to play.